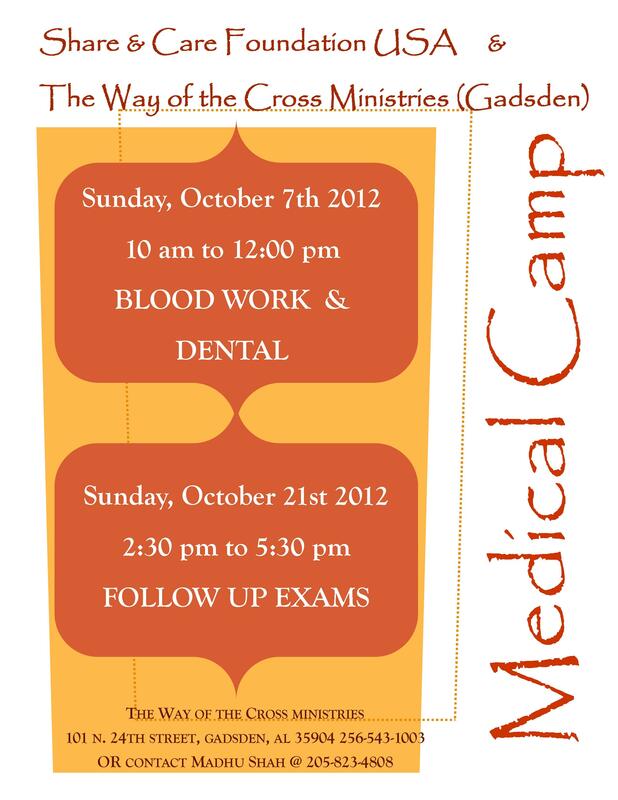 Share and Care Foundation and The Way of the Cross Ministries is arranging a Medical Camp in Gadsden, Alabama. July 15, Friday: Medical Camp at Kalyanpusti Haveli,Vastrapur; Ahmedabad India by Share and Care Foundation Ahmedabad Chapter. Very good Success. More than 95 Senior Citizen participated .The camp was organized by Jansuvidha Medical Services and Gujarat Cancer Society with pious hands & blessing of PP 108 Shri Dwarkeshlalji Maharaj. We are thankful to R.K Shah, Deepak G Shukla, Narendrasinh Chavad, Bhaskar Shukla,Divyesh Surati and Atul Pnadya of Jansuvidha Medical Services. Also thankful to Dr Pankaj M Shah, Prasant Kinariwala, Dr Kirit Patel and Dr Siddhartha Mukharjee of Gujarat Cancer Society. Special thanks to Dr Bhupenra Shah and Bansibhai Patel. Health Fair Part-2 Sept 9’12 at Hindu Temple, Birmingham AL. Great Success. More than 170 people participated .More than 86 participants got their blood report, 50 got Eye Checkup, 40 got dental checkup,30 got Ultrasound screening. Thanks to our Drs. Team, Organization, Registration, Welcome and Volunteers Team. Thanks to Hindu Temple’s Management for their support.